L. really, really likes chicken that comes on bones. I don’t know if it’s the whole built-in handle thing that holds the appeal for him, or if he just enjoys the flavor more; but almost any chance he gets, he’ll ask to eat chicken on the bone for dinner. From there, it’s a short leap to deciding that chicken wings — with their diminutive size and equally small price point — were a good match for his lunchbox. He’s not a huge spicy food fan (yet), so Buffalo wings were out, but after playing around a bit I hit upon this honey-garlic recipe that he loved so much he not only requested them for his birthday party this year, but actually asked for AGAIN a few days later. The photo is evidence of how popular these are — I wanted to pack them in his lunchbox, but every time I make them, there are never any left for lunches. I just barely managed to snag this picture of them on a plate in our kitchen before he munched these, too. Preheat oven to 425 degrees. Rub wings with olive oil and season with salt and pepper. Place the wings in a roasting pan and roast at 425 degrees for 15 minutes, to cook the chicken and render some of the fat out of the skin. While the wings are cooking, make the sauce. In a medium saucepan, saute garlic in butter until translucent, about 5 minutes. Add the honey, red pepper flakes, oregano, tomato paste, and salt, and whisk thoroughly. Cook over medium-high heat for 10 minutes to thicken the glaze. Remove the wings from the oven and baste with about 2/3 of the glaze. Return the wings to the oven and roast for an additional 8 minutes. Over medium-high heat, add the chicken stock to the remaining glaze and bring to a boil. Reduce the liquid to about 3 tablespoons. 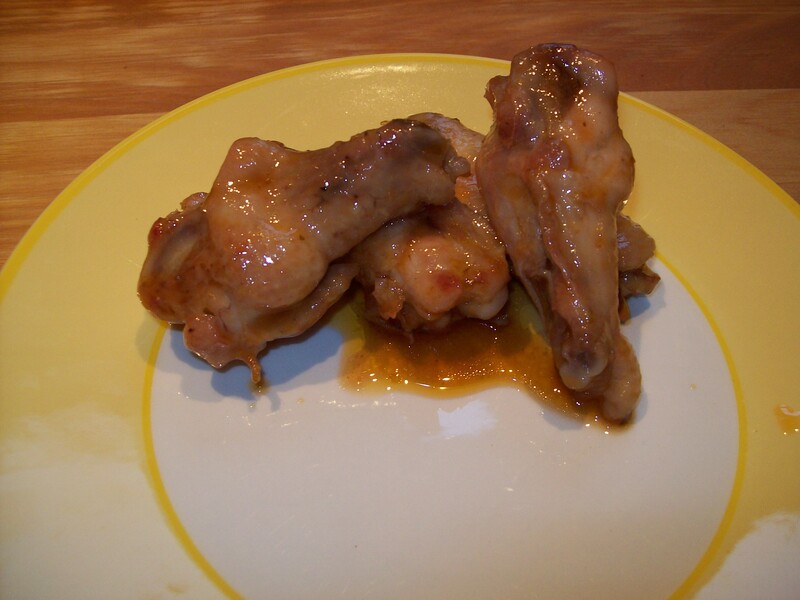 Remove the wings from the oven, toss with the sauce, and serve.